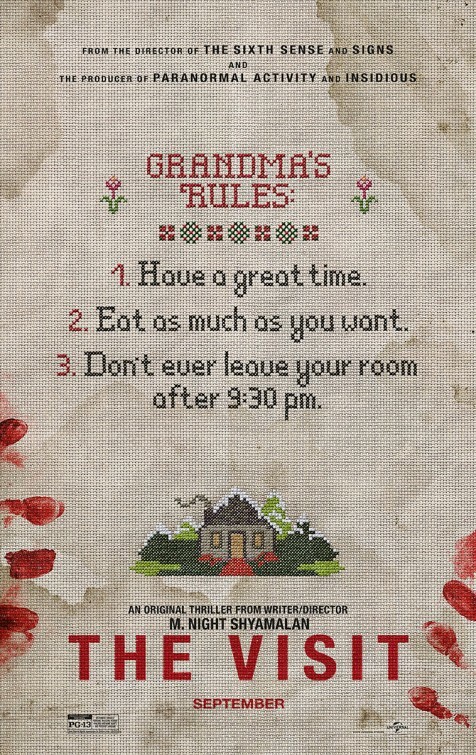 I first heard about The Visit around the beginning of its production and when I finally saw the first trailer I couldn’t wait to see it. I had heard that the twist at the ending of the movie was going to be so unexpected and was going to be the most thrilling and suspenseful movie of the year. So, when I left the theater and started on my way home completely and utterly disappointed that I had even wasted my time to see the movie, need less to say I was a bit angry. Becca (Oliva DeJonge) and Tyler (Ed Oxenbould) set out to visit their grandparents for the first time in their life in M. Night Shyamalan’s supposed comeback. While visiting, Becca plans to make a documentary that will hopefully serve to repair the damaged relationship between their mother (Kathryn Hahn) and her estranged parents. Though, throughout their stay, the children begin to realize there is something seriously wrong with their grandparents (Deanna Dunagan and Peter McRobbie), and set out to solve the mystery behind them. The biggest problem I had with The Visit was that it was sold as a horror movie but became a comedy. Between the narration from an obnoxious teenage girl, the confusion as to why a mother would abandon her children with essentially strangers, and the general uninteresting plot, the film was in shambles. As for the twist, I will give points to Shyamalan for presenting a conclusion that I had not suspected the entire film, despite the clues being presented to the audience. Though, by the time it does conclude, you’re probably so uninvolved with the movie that you don’t exactly care anymore.